Thanks to the quick actions of an RNLI crew member, two young girls were saved from drowning when they went under the water on their way back from ‘walking the fort’. The quick actions of crew from Bembridge RNLI lifeboat saved the lives of two young girls taking part in the St Helens and Bembridge Fort Walk on Monday night. The volunteer three-man crew of ‘RNLB Norman Harvey’ (D-778) re-united two dogs with their owners and towards the end of the walk rescued two girls – thought to be aged around seven and ten – who “nearly drowned”. Bembridge RNLI say the girls fell into some deep holes in Bembridge Channel when they were walking back from having ‘walked to the Fort’. Having been monitoring their progress, a quick thinking crew member swum to rescue the girls and took them back to the ‘Norman Harvey’. They were taken to shore to rendezvous with local Coastguard officers and to be reunited with the remaining members of their party, but left the scene without giving any details to the Coastguard or without being checked over medically. There was a concern that without medical assessment, as they had possibly ingested a quantity of water when went underwater, they were at risk from ‘secondary drowning’. 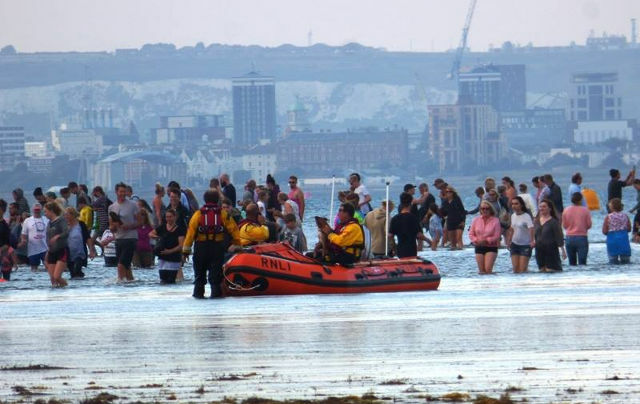 If you intend to ‘do the Fort Walk’, it’s always worth reading the safety advice issued by Bembridge RNLI, such as the two separate articles OnTheWight ran prior to this year’s walk. In a separate incident a child, initially thought to be suffering from anaphylactic shock, was taken back to the Lifeboat Station and handed over to a waiting ambulance.